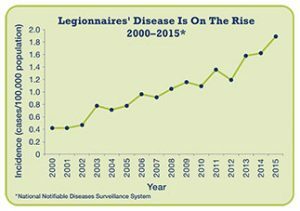 According to the CDC and in spite of years of research, the scientific community remains in the dark as to the cause (but not necessarily the source) of the rising rate of infections from the Legionella bacteria in the Unites States today. Between the years of 2000 and 2015 the estimated number of cases has increased almost 450% reaching the level of approximately 6,000 cases reported by 2015. Lenox Hill, NY – In a two week period back in June, there were several cases of Legionnaire’s Disease in and around Manhattan NY’s Lenox Hill neighborhood. One elderly person with “significant underlying health conditions” died and 8 people were hospitalized temporarily. With the usual suspect of a cooling tower, investigations soon identified 116 systems within half a kilometer and testing began. The New York City Department of Health and Mental Hygiene quickly found 42 had traces of Legionella DNA, 24 of which had quite low levels. Ongoing testing is being conducted to match the DNA with the individual infections to determine which of the identified cooling tower system or systems were responsible for the outbreak. Memphis, TN – Elvis Presley’s Famous Graceland vacation destination was rocked with an outbreak of Legionnaire’s Disease the first week of July this year. By the end of the week 6 cases were confirmed. It has been estimated that those cases were initially contacted between May 15 and June 26. The Shelby County Health Department has recommended anyone with symptoms who visited the park during those dates should contact them immediately. The aquatic facilities at the hotel were closed for examination. So far, those who have been infected all stayed at the Guest House at Graceland between those dates. 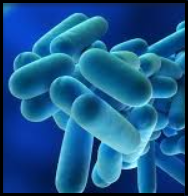 W.Va. – Recently the Department of Health & Human Resources has reported an increase in the number of cases suspected of being Legionnaires’ Disease during the months of May and June this year. One major problem with Legionella is that it’s resistant to chlorine. Cleaning and maintaining a safe cooling tower is not as easy as it might seem. A DNA test to confirm the source takes time. One benefit there is that all cooling towers in a given area are investigated which frequently finds more contaminations than infections and helps reinforce the reality that there is more lurking there than we know. Diligence seems to be a major factor in limiting the outbreaks and local jurisdictions are starting to look into regular cooling tower inspections and mandated cleaning procedures as a layer of bureaucracy they feel is needed to help combat infections.